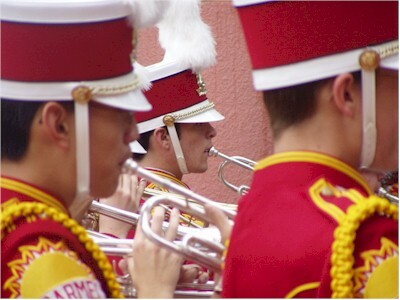 The Marching Sundevils competed in a parade tournament down in Chula Vista today. During this warm-up, held in a partially-sheltered area of a shopping mall, the kids got a little wet as the rain sprinkled down. The skies cleared for their competition, however, and Mount Carmel won the sweepstakes award over their arch rivals from the north, Rancho Bernardo!